Packed with the power of five superfoods, this Superfood smoothie mix is the perfect way to get more nutrient density in your diet. Packed with the power of five superfoods, this Superfood smoothie mix is the perfect way to get more nutrient density in your diet. A concentrated and potent synergistic blend of Lucuma, Mesquite, Raw Cacao, Hemp Seeds, and Maca, as well as key medicinal herbs, Taheebo, and Cinnamon, provide a broad energising spectrum of essential vibration. 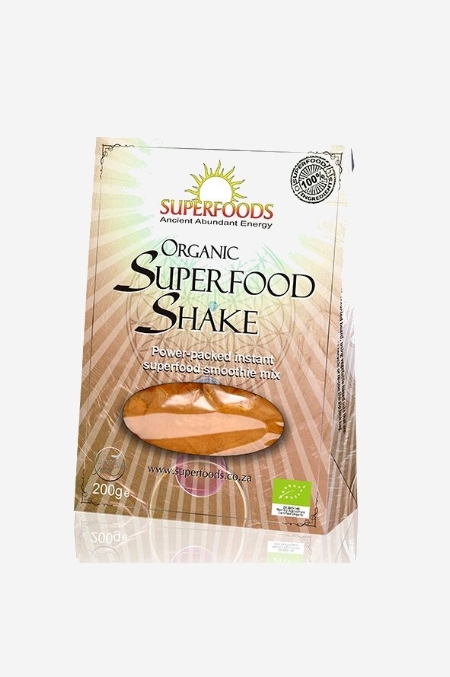 SuperfoodShake tastes like chocolate milkshake, yummy for the whole family. Daily use is recommended to assist with dietary upgrading. Lucuma, Mesquite, Raw Cacao Powder, Hemp Seeds, Maca, Taheebo, Cinnamon, Vanilla Powder, Sea Salt.